The West African phenomenon, Highlife music, is many things to many people. To some, it is a colonial legacy. To others, it is an abiding aesthetic. Yet to some, it is dance music for wiggling derrières, perhaps the finest that came out of West Africa in the period spanning about twenty-five years on both sides of colonial independence. There are several narratives about the origin of this music but they all have the same dénouement: West African musicians are wedded to western musical instruments and the couple live happily ever after. There is the narrative of Caribbean sailors bringing in guitars on their shipping expeditions. There is the narrative of how, in the heat of colonisation, Africans were trained to play music for the white colonisers and their elite subordinates, usually ballroom dance music and swing. Somewhere along the line, the proficiency of these trained musicians was recruited to play indigenous songs and Highlife music was born. This music was first described in Ghana as ‘Highlife’ in the 1920s, in the context of its elitist patrons. 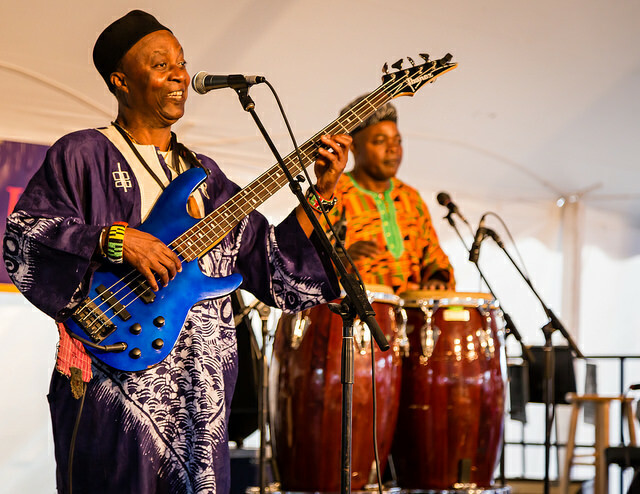 Enter John Collins, the naturalised Ghanaian of British descent, a guitarist and an ethnomusicologist, and perhaps the foremost scholar of Highlife music. Collins adds yet another book to the body of scholarship on African music, which has always derived significant sustenance from the work of foreigners. His latest book, Highlife Giants, is sub-titled ‘West African Dance Band Pioneers’, which pretty much delineates the range of book. Divided into four sections and endowed with a splash of vintage images, this book dwells on the origin and spread of Highlife across West Africa, but there is a bias for two countries, Nigeria and Ghana, and the reason is not far-fetched: Ghana (alongside Sierra Leone) is the place of origin of Highlife; Nigeria was its destination. Nigeria and Ghana have quite a curious relationship. The politics of their cultural relationship is such that the smaller and often more inventive Ghana hardly ever gets credit for its inventions; Nigeria always intervenes. From Highlife all the way to Azonto, Nigeria has been appropriating Ghanaian cultural outputs for decades. John Collins sets the records straight in Highlife Giants. A collage of interviews, observations, informed commentary and pictures, this book, like many of his earlier books, takes its direction from his diaries. Collins affirms the origin of early Highlife music in Ghana (he evades the Sierra Leone side of the coin) and speaks on how this music found its way to other West African countries. No story of Highlife music is complete without a mention of E T Mensah, the influential Ghanaian trumpeter who led The Tempos band. A pharmacist by profession, Mensah who died in 1996, is best known for his contribution to music. In a sense, Highlife Giants follows Mensah, his Tempos band and the sphere of their influence. Mensah enjoyed a robust relationship with and the patronage of Ghana’s first president, Kwame Nkrumah. In the wake of botched plans to tour Europe, he and his band went around countries in West Africa instead. This was sometime in the ‘50s and, according to Mensah and Collins, this is how Highlife music found its way to the rest of West Africa. However, Bobby Benson, arguably Nigeria’s equivalent of Mensah, told another expert on West African music, Christoper Alan Waterman, something contrary. His contact with Highlife predated Mensah’s tour: it was in 1938 when Ghana’s Cape Coast Sugar Babies Orchestra toured Nigeria. Regardless of timing, the consensus is that Highlife music came to Nigeria by way of Ghana. John Collins strategy for telling the story of Highlife is to carefully select his dramatis personae. He picks E T Mensah as lead character, a musician’s whose influence on Highlife is indelible. By concisely telling Mensah’s story (Collins has written more extensively on Mensah elsewhere), Collins maps the influence of E T Mensah with geographical exactness. Even though the Francophone countries between Ghana and Nigeria – Togo and Benin Republic – were more influenced by Congolese music, Collins points us to relevant Highlife influences on the cultures of Togo and Benin before making the last leg of the coastal journey to Lagos, where he addresses the larger-than-life character of Bobby Benson, who was more the cultural entrepreneur and thespian than the consummate Highlife musician. In a sense, calling this book ‘Highlife Giants’ is indeed ironic because the real ‘Highlife Giants’ were the club owners who owned the musical instruments; they were the ones who hired and fired musicians, who pitted musicians against each other for sport, who underpaid musicians and made it incumbent on musicians to travel so far and wide to earn their meagre keep. Benson formed the Jam Session Orchestra Band, a springboard and a flagship school for many Nigerian Highlife musicians, including the likes of Victor Olaiya, Zeal Onyia, Bayo Martins, Eddy Okonta and Babyface Paul Osamade, who in turn mentored the next generation of musicians. Highlife Giants also travels hinterland, to Nigeria’s ‘Midwest’, to interview the all-round genius, Victor Uwaifo, before heading down to Onitsha to greet that city’s illustrious son, Stephen Osadebe. The narrative finally shifts planes and travels in time to present day West Africa, to rifle through popular music in search of Highlife’s influence. At the core of these interrupted narratives is the picture of what it meant to be a musician in the ‘50s and ‘60s. It was an arduous itinerant life of travelling frequently and earning very little. There were only a few cats with nine lives, those whose lives did not succumb to the roads they travelled, which were deathtraps. Of those who survived road accidents, very few musicians were able to earn enough to last them till old age. There are similarities between Highlife Giants and Kalakuta Notes. The latter is a book Collins wrote on Fela Anikulapo-Kuti, drawing material from the diary Collins kept when the film Black President was being shot in the ‘70s. Collins played a minor role in the film but more importantly, his remembrance is the major basis of his profound book on the character of Fela. Reading both books, one is struck by Collins’ style of writing from the past into the present. Indeed, he is more concerned about how the past influences the present than how the present presents itself. The basis for this style is best captured in Victor Olaiya’s response when Collins interviewed him. Olaiya said, ‘All forms that emerged are in fact distant off-shoots of highlife. So, in fact, highlife music did not lose its hold, it only transformed into more dynamic tunes’ (p 160). Highlife Giants is not without fault. In addition to the problem of misspellings and other solecisms, it seems no fact checking was done. Or how else can we explain Julius Ekemode’s brief sojourn to a place called ‘Akure-Ekiti’, which is yet to exist on the Nigerian map, or the claim that Cardinal Rex Lawson hailed from Cross River State? Interestingly, the farther the book moves from Ghana, the more noticeable the factual errors. However, the relevance of the book cannot be overstated in the wake of the recent social media furore over comments by the fast-rising artiste, Mr Eazi, on how Nigerian music feeds off Ghana’s. Many Nigerians responded with a sharp tongue, insults and humour, all devoid of facts. To this end, Highlife Giants is indeed a recommended text for any Nigerian music-lover deficient in their understanding of how popular music has evolved.